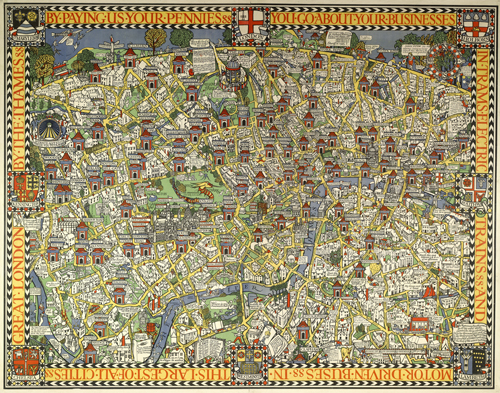 This is a fabulous exhibition for anyone who is interested in the history of the Underground or who loves maps. And if, like me, that ticks both boxes, well, you’re in for a real treat. Let’s first address the Harry Beck thing. Worthy of an exhibition in his own right. 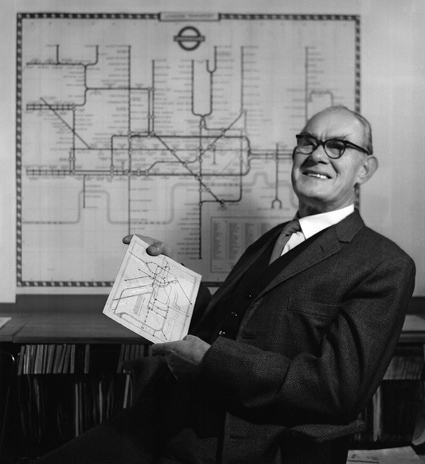 Harry Beck (1902 – 74)was the design draughtsman who devised the original diagrammatic London Underground map as we know it today. 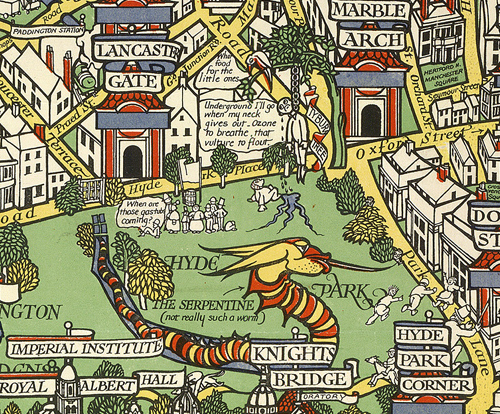 There is more than enough here for Beck fans, from one of his earliest hand-drawn sketches (1931), through his early versions where intersection station were represented as diamonds, through quite recent post-Beck representations which excluded the Thames entirely (hugely unpopular) and through to today. 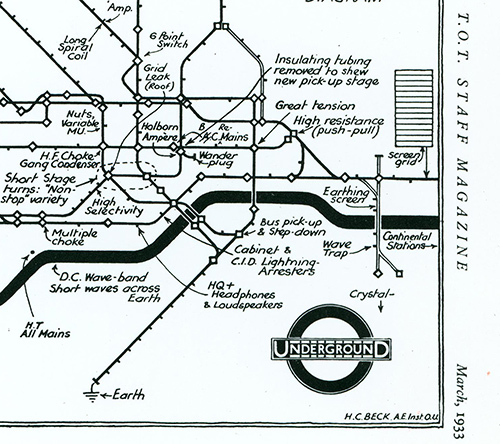 A special treat was Beck’s spoof tube map of 1933 literally done as a wiring diagram. Beck playing it for laughs, I always had him down as quite the serious cove. 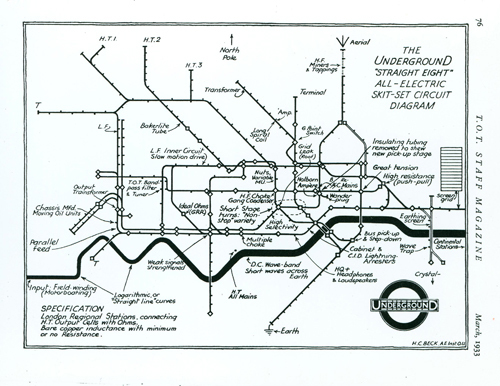 Harry Beck: “The Underground ‘straight eight’ all-electric skit-set circuit diagram” (1933). There is so much to relish. I’ll mention two personal highlights. One: discovering MacDonald Gill. He was the brother of the more celebrated Eric Gill, sculptor and typographer. Like his sibling MacDonald was a talented type designer but also a wonderful illustrator. He was active from just before WWI and through the interwar period. Although in many of his works he played is straight, so to speak, many of his creations were large, colourful, incredibly detailed and festooned with tiny cartoons, jokes, puns and quotes. It is said that punters frequently missed their trains while reading them. Two: The tube system of 1928 superimposed on Roque’s famous London map of 1746, a simple idea, probably easily done, but inspired nonetheless. The creator remains unknown. BY PAYING US YOUR PENNIES, YOU GO ABOUT YOUR BUSINESSES. IN TRAMS, ELECTRIC TRAINS AND MOTOR DRIVEN BUSES. IN THIS LARGEST OF ALL CITIES. GREAT LONDON BY THE THAMES. As the wish of the artist is. MacDonald Gill. “By paying us all your pennies…” – detail. And here is the 1928 Underground superimposed on Roque’s map. 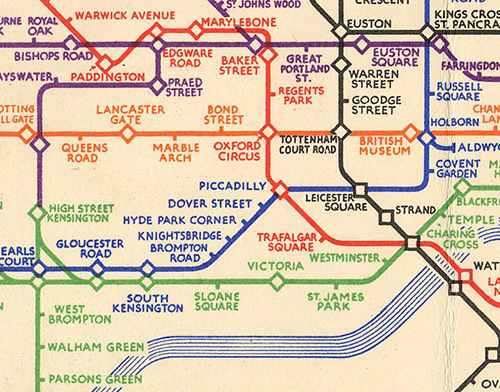 I’ve mentioned but a tiny few of the many dozens of examples on display from the early 20C, the Frank Pick years, Pick being the man who imposed unifying design principles on the Tube network, both architecturally and graphically. Fast forward to living memory and enjoy again the 1980s punny advert for The Tate represented by the map made from tubes of oil paint. Simon Patterson’s celebrated Great Bear from 1992 (all the stations renamed as movie stars, scientists, philosophers etc.) is updated with an equally amusing version, named Saptarishi. Simon Wood recorded all his Underground journeys on GPS for 10 years and turned it into a map. Remember this? 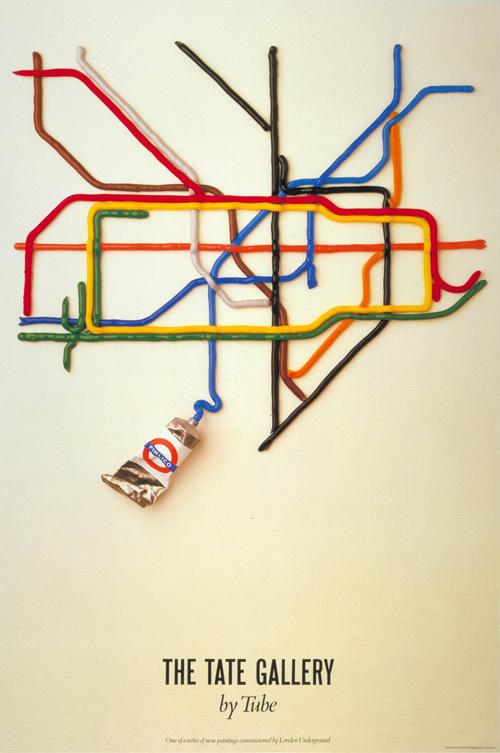 The Tate Gallery by tube, by David Booth of the agency Fine White Line, 1987. This is all the big stuff. We mustn’t forget the most common format of all and friend to millions of visitors to our city: the pocket map. There is a handsome selection on display. Buses too. General Omnibus Company pocket map from 1931. What I have briefly described here is barely scratching the surface of this wonderful exhibition. Public transport, cartography, art, functionality and fun. It’s all here in one show. Don’t miss it. 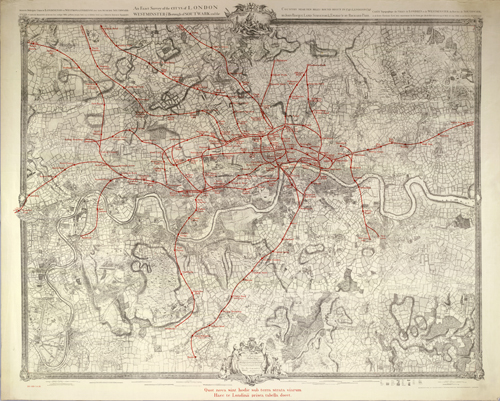 Mind the Map runs until 28 October at the London Transport Museum, Covent Garden. Entry is free with full museum ticket at £13.50 (£10 concessions). Review: London Underground. Architecture, Design and History. 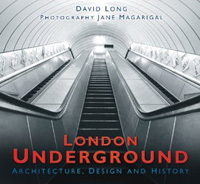 With this new book, prolific London history author David Long returns to the London Underground (an earlier work, The Little Book of the London Underground (2009), is a compendium of interesting facts, stories and statistics about the network). This is the first book on the topic which I have read that focuses purely on the aesthetics of the system. Except in passing, you will find very little in this book about engineering, trains, timetables and the like. It is – as the title suggests – all about architecture and design. We learn about the two main architects of the 1900s and 1930s generations of stations, Leslie Green and Charles Holden respectively. We find out how the Underground’s “target” logo came into being. 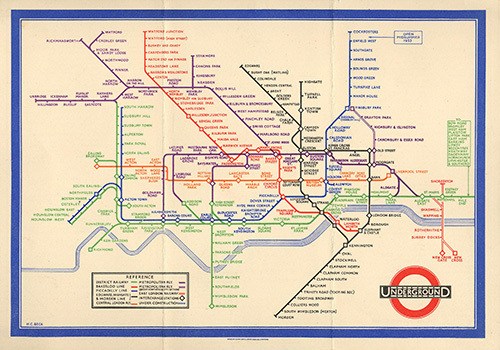 We read all about Edward Johnston, the typographer who devised the ubiquitous typeface on all Underground signage. 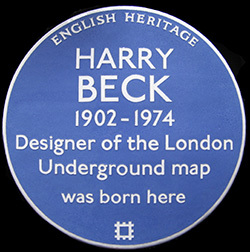 And, of course, the draftsman Harry Beck, who gave not only London but most city transit systems worldwide the method of creating an easily understandable, diagrammatic map. We Londoners like to grumble about the Tube. Despite its faults, most of us secretly love it and are proud of it; in our hearts we know it is a wonderful system. For despite its complexity, it is easy to understand and use. The credit for this goes to a handful of architects and designers who did their work almost a century ago. And at their centre was one man, the hero of the book: Frank Pick. Pick was not an artist, a designer or an architect. He was, in fact, an administrator who rose through the ranks. But he had an instinct for talent-spotting and knowing what needed to be done. In the early decades of the 20th Century the tube system, comprising various different railway companies with different cultures and modi operandi were integrated into one unified organisation. Operationally, this was a challenge. But equally important was how this was presented to the public, how it was sold, how confidence in the system was built. More than any marketing man or advertising guru, Pick understood the value of branding. It was he who set the standard for buildings, signage, advertising and posters – ensuring compliance and attention to detail to the nth degree. The result could have been disastrous except in the hands of a man of taste and discernment with natural empathy for the age, a man both of his time and ahead of it. The result is that London’s urban transport system – including our red buses, of course – is one of the most recognisable brands on the planet. This book tells the story. London Underground is richly illustrated with hitherto unseen 1970s black and white photographs by Jane Magarigal which provide a nice nostalgic touch for those of us who wish the Tube still looked like it used to. London Underground. Architecture, Design and History is published by the History Press. List price is £18.99, but available for around £13.00. 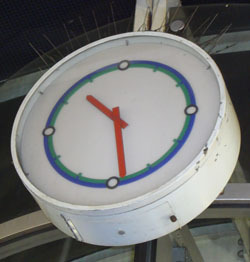 Have you ever seen a more unpleasant public clock? Hammersmith Station. Update: A reader has quite rightly pointed out (via Facebook) that the design is based on Harry Beck’s tube diagram, using Piccadilly and District Line colours, both of which service Hammersmith. This partially redeems it, I suppose, but I still say it’s ugly. Beck eschewed curves (except little ones at corners) and I think possibly this is the problem here.